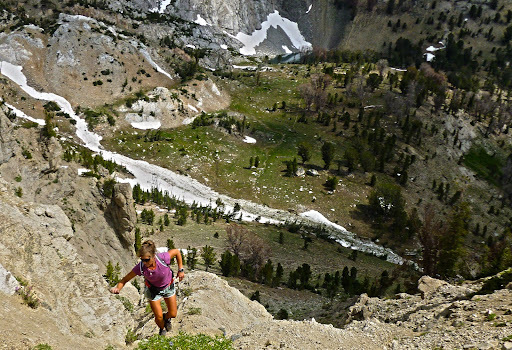 Run Junkie: Annals of Summer: Photo of the Week - "The Pass"
So, how does trail running differ from road running? A picture's worth a thousand words. Closing out 19 backcountry miles with a grunt up from Box Canyon to Johnstone Pass (elev 10,000 ft); Pioneer Mountains, Idaho. Just wondering what camera you shoot your pics with and how you carry/protect it? Love the blog, especially the pics, please keep it up. @Justus. Thanks for the feedback. Right now, I use a Panasonic Lumix FH27. I'm partial to Lumix's Leica lens. It's pretty compact, takes nice photos, and is mid-range in price, which is one of my criteria for a trail camera. I take a lot of photos on the run, so usually just have it in a front pocket of my hydration pack or carry it in my hand. No special protection, so there's always the danger of breaking it in a fall or dropping it while fumbling for a gel. If I keep price to mid-range, it's not so tough a loss - and in reality usually means it's time for an upgrade, the way camera functionality advances. Cheers. Wow. That is a very cool photo. The depth with the subject up close and valley floor far below really sets it off nicely. @ChrisB, thanks very much. The camera never seems to due justice to the steepness. It did this time, though. Turns out it takes a near 45 degree pitch.